Wireless lavalier microphone systems are an invaluable tool in any filmmaking arsenal. They are often times the best tool for interviews, presentations, vlogs, and filmmaking. Boom microphones can only get you so far in your filmmaking journey. We’re going to help you find the best wireless lavalier microphone systems on the market to make a perfect choice for your needs and budget. The kits we reviewed below each contain one transmitter, one receiver, and one omnidirectional microphone. If you’re doing audio work consistently we recommend you have between 2-4 kits, depending on the nature of that work. 1.1 What Do These Criteria Mean? 1.2 Why Do You Need A Wireless Lavalier Microphone? Here are some brief explanations of the different technical terms found in the above comparison table. Dynamic range is a representation of the potential range between the loudest and quietest sound that a device can transmit. The larger the dynamic range, the more layered and detailed a recording could potentially be. Do keep in mind that a healthy human only has a dynamic range of about 120dB, so it’s safe to assume any devices that are getting close to that are going to perform well. A few of the cheaper devices we looked at did not list the dynamic range, so you can assume they will be on the lower end of the spectrum. Wireless systems have the option of either using high or low frequency bands when communicating. Higher frequency bands are becoming more popular, and even the cheap ones maintain a strong signal because of how pervasive the technology is. However, old-school low frequency bands are still very popular. Higher frequencies (GHz) have a wider bandwidth, meaning they have less range and struggle more with interference, however they can transmit much more information in a shorter amount of time. Lower Frequencies (MHz) on the other hand, can penetrate through more objects and have a farther range, making them great for situations where you’re going to be dealing with a lot of interference. They’re also a little bit more reliable if you’re trying to record a really important shot. Why Do You Need A Wireless Lavalier Microphone? Here are just a few of the reasons why wireless lavs are an absolutely necessary addition to your arsenal. They can get sound in places nothing else can – Sometimes your framing is too wide for a boom microphone to get a decent recording. Or maybe you’re in a small cave where there’s only room for a camera and your subject. Lavaliers make the recording possibilities endless. They are discrete – Not every location is suitable for a massive boom microphone, especially if you’re an indie filmmaker without a permit. Wireless lavs allow you to record audio anywhere while looking completely inconspicuous. They’re perfect for vlogging – If you don’t buy a lavalier, that means you either need to hire a dedicated audio guy for your videos, or be limited to the audio from your shotgun mic, which limits how far you will be able to stray from the camera. Lavaliers free you up to run all over the place while your audience hears you! 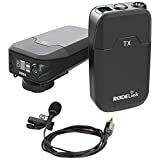 They can hook up directly to your camera – While boom microphones require an external recorder with an XLR port, lavalier receivers can often be plugged directly into your camera. Note: If you’re looking for a way to wirelessly boom your shot, we also wrote a guide detailing the best wireless boom transmitters. 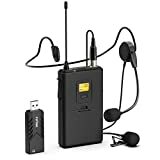 This is without a doubt the best wireless lavalier system on this entire list. This is an Industry Standard Lavalier. The Sennheiser EW 112P is used by many professionals on all kinds of shoots and is astounding in both microphone and transmitter quality. Even I myself have used it doing sound on some commercials and it dominates. Interference is for the most part, nonexistent, and when it is, the transmitters are capable of scanning for open frequencies. It’s quite expensive, at around $600, but if you are doing professional work this price is necessary. I’ve read through dozens of reviews where the user has stated it’s worth every penny. It has XLR, line output and camera adapter cables so that it can be sure to be compatible with whatever microphone you are working with. However, the included lapel microphone is nothing short of excellent. It picks up vocals with awesome clarity and handles like a breeze in high wind conditions (haha). The durability of the transmitter and receiver are incredible. I’ve owned one of these personally for years and have watched careless talent drop them hundreds of times. Not so much as the slightest decrease in performance. The device uses a 42MHz signal with 1680 UHF frequencies so that you’ll never have a problem with interference. There’s a feature that allows you to scan all frequencies to select one without interference. You can use this every time you get to a new location to make sure your audio is always crisp and clear. If you are getting paid to do sound work, we don’t think there is any excuse for buying any lavalier on this list other than this one. Maybe the Rode one below, but the Sennheiser EWs have an unmatched quality and sound that is required for your sound gigs. Be Advised: the interface on the transmitters is a little complex for a novice, but after a few hours of playing with it, we were able to have it all figured out. If you want professional quality sound for your short films or commercials but can’t afford the Sennheisers, this is surely the next best thing. The RodeLink Wireless Filmmaker System is a more modern take on the wireless lavalier, using a 2.4GHz digital transmission rather than a low Mhz one like many of the other lavaliers. This technology is very resistant to interference because of the frequency hopping features that it comes with. You can shoot in busy cities with tons of wireless interference without needing to worry about a loss of audio quality. It’s even possible to have 8 of them in one room without needing to adjust the frequencies on all of them, which is great, and can’t be said about any other lavalier we’ve listed. The microphone included even includes a locking screw to prevent it from being unplugged. Speaking of which, it’s sound quality is great. it sounds clean and you definitely won’t be wishing it was better. The microphone included usually goes for nearly $300 by itself, and with that price tag you know it’s going to crush all of the cheaper options on this list. Although the construction is plastic, and the device could feel a tiny bit more sturdy, the battery life is excellent and you can look to get 10-14 hours off of a pair. That’s a full shoot day! You can even plug it into a USB battery pack for infinite usage if you so desire. The setup of the RodeLink is very simple. All you have to do is turn them on and choose a few settings before you’re ready to shoot. No wasting time scanning for channels. as long as your transmitter and receiver are on the same one, they will communicate via encrpyted 2.4GHz transmissions. All the searching is done automatically rather than manually, so you can focus on what matters. If you’re a mid-range filmmaker, this one is our recommendation for you. 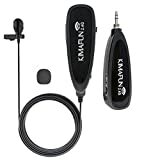 We think this is the best wireless lavalier microphone for people who aren’t necessarily working in the film industry, but are looking to create their own content in the form of short films or YouTube videos. At under $200, this is less than half the price of the Rode, and less than a third of the price of the Sennheisers. Taking this into consideration, it’s amazing that the quality can be so great at such a low price. This Lavalier system claims a range of 328 feet, and has 48 selectable channels. Some users have noted the actual range to be much shorter than that, so be wary if you’ll need to be far away from your target. It operates at an UHF frequency range of 584 Mhz – 608 Mhz, which is great for wireless recording. The battery life is 8 hours, but fortunately this lapel microphone system uses AA batteries, so you can swap them and keep shooting indefinitely. Channel searching is included and for the most part interference isn’t too much of an issue*. The transmitter includes both a line and 3.5mm microphone jack, and the receiver includes a headphone jack for monitoring during recording in addition to the output. XLR cable converters are even included if you want to use a microphone other than the one included. We don’t think you’ll have to do that though, because the microphone included is excellent. Your vocals will be clean and crisp so long as you make sure there isn’t interference. *A minority of users have encountered interference problems on set that they had a hard time correcting. This is okay if you’re just making a film with your friends or Vlogging out in public, but we do not recommend this product for professional paid film gigs. When it works however, it works great! Simple universal 3.5mm Receiver that can be used with just about anything. This is without a doubt the best value you can get in a wireless lapel microphone system. It’s ridiculously cheap, sitting at just $50, but the reviews and performance were still very impressive to us. Of course at $50 you shouldn’t set your expectations too high in terms of audio fidelity, but it’s still very impressive for what it is. The simple 3.5mm Receiver makes this the perfect device for running small events or making videos around the house. It can be plugged directly into your camera, or even your laptop. We liked that Kimafun opted for a high frequency bandwidth, which seems to have a better consistency when it comes to lower-end devices. The distance range is quite a bit shorter, at only 50 feet – like we said, this is a cheaper device for people who won’t be moving around too much. If you’re able to stay reasonably close to the receiver however, this product is a great value. The battery life sits at an impressive 6 hours of battery life, and aside from that, there’s not much more to mention. This product was chosen for it’s impressive quality to cost ratio, and if you’re looking to spend as little money as possible while having a functioning wireless signal, this should be your best bet. This is also a great device if you’re going to be vlogging with your smartphone. Here’s a product I didn’t know existed until I started doing research for this guide. The Fifine wireless microphone is everything you would expect out of a lavalier, except it has an unconventional USB receiver. That means you can now record directly from your lapel microphone to your computer without the need for external mixers or recorders! This is perfect if you’re recording stuff for an audio or video podcast, or are doing any work in an environment where you can record direct to a computer. You’re only going to get about 80 feet of range with this thing, so we recommend avoiding the outdoors unless you’re going to be sticking near your subject. It will also work great for live streaming, especially in streams where you’re moving around rather than just sitting at a desk. It has 25 channels in the UHF range of 672-684 MHz, and people have had pretty positive experiences in terms of interference. It’s plug and play without the need for any software, and has little to no latency if you’re outputting the audio through your computer’s speakers. The transmitter is powered with 2 AA batteries, so you can keep on recording forever if you swap em out! The microphone of course isn’t as pristine and high-fidelity as the one included with the Sennheiser, but it will probably perform better than whatever microphone is on your laptop. You would definitely not want to use this one on your films or on professional work. For YouTube, streams, and podcasts however, this is a great low budget USB wireless lavalier microphone. I have yet to work on a shoot where a Lavalier transmitter was not dropped at least once. You’re going to be attaching these devices onto people who may not understand how to operate it. They are also likely to forget they have it on them and drop it when removing their clothes. In any case, it’s pretty important that the build quality of your wireless lavalier microphone system can withstand a little bit of damage. When thinking about build quality it’s also necessary to consider weight. If you’re vlogging all day long you probably won’t want a clunky transmitter on your hip, so if you need your lavalier to be lightweight, take that into consideration! This factor is more important in some professional applications than others. If you know you’re going to be using your microphones in a small controlled environment (like a podcast) where you can be mixing nearby, operating range will not be as important for you. On the other hand, if you are doing event coverage or following some subjects around, it is important your operating range is sufficient. Even if your target is within the listed operating range, things like obstacles or interference can cause issues as your subject gets farther away. It’s a no brainer that you should carefully compare and consider the operating range of the wireless lav system you end up purchasing. Longer is always better. You never know what situations you’ll encounter in film. The first thing you think about when purchasing a microphone, obviously. Sometimes it doesn’t matter all too much. If you’re just looking into making some YouTube videos or need a wireless lav mic for church work, your audio quality doesn’t need to be pristine. 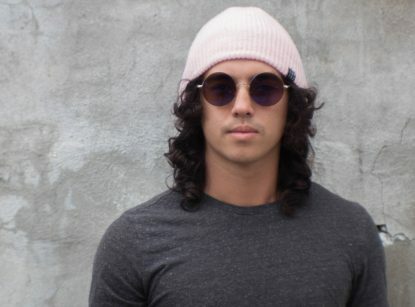 However, if you’re doing any sort of professional film work or are making an independent film, you’re going to need the highest quality microphone you can get. It’s also important that you consider the directionality of the mic included. Some mics are highly directional, while others are omnidirectional. Doing event coverage will be better suited with a different mic than quiet film vocals, so make sure you’re getting the right type of microphone to suit your needs. The microphones on each lavalier system will vary, as will the transmitters. If you think you’ve found a transmitter that does the job well but the microphone is holding you back, you can always purchase a high-quality lapel microphone separately. We’re working on a guide to the best lapel microphones to help you out with that in the future. When choosing your wireless lavalier mic, some of your options may advertise special features that you don’t understand. Here’s the basics behind a few of them. Channel Scanning – An important feature for wireless lavalier microphones that don’t have the above technology. Channel scanning allows you to scan the frequencies so that you can find a clear one for your audio recordings. Battery Compatibility – Some of the lavaliers we examined featured built in rechargeable batteries, while others contained AA battery slots or even USB charging ports. We would say that if you know you’re going to be filming for long periods of time, it is important you get one with AA batteries or a usb charge slot so that you don’t end up with any downtime during a shoot.